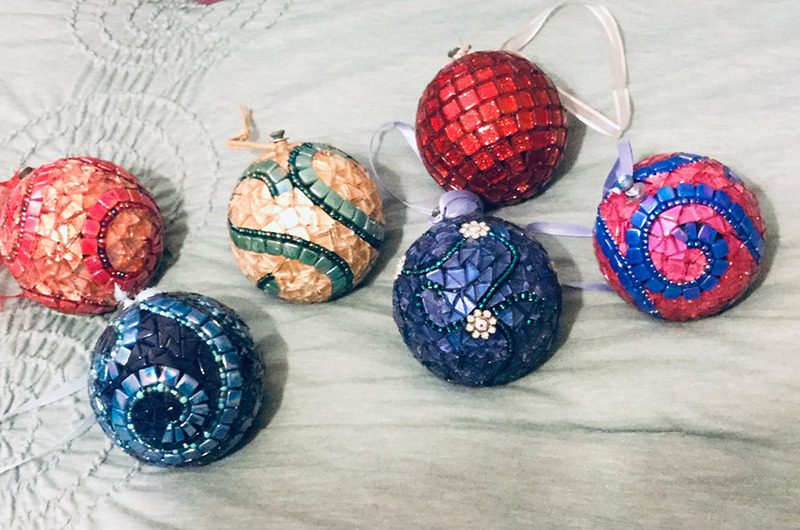 Artist Morgan Halford recently emailed us some pictures of some mosaic Christmas-tree ornaments she made with the spherical bases we sell, and I wanted to show them off for two reasons. First, the tiling is tightly executed in terms of grout gap and pattern, and the designs she used are interesting and eye catching. 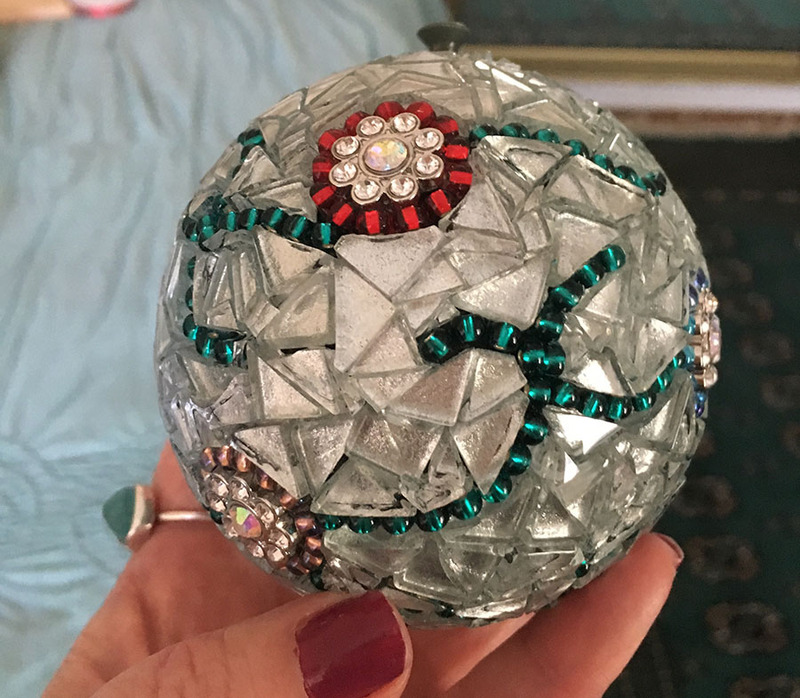 Mosaic Christmas-tree ornament Silver mirror tile with glass beads and rhinestones. 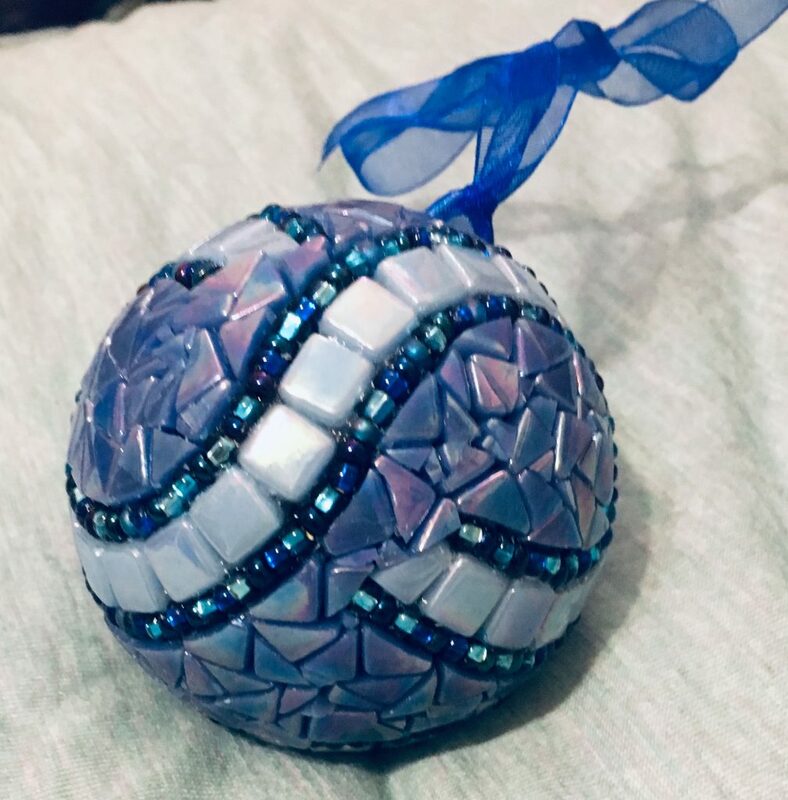 Second, Morgan really dressed up her ornaments with rhinestones and glass beads and replaced the string that comes with the bases with colored ribbons, and that makes them a good example of how you can use a kit or a base as a starting point and then customize it. Mosaic Christmas-tree ornament blue with blue ribbon replacing the plain string. 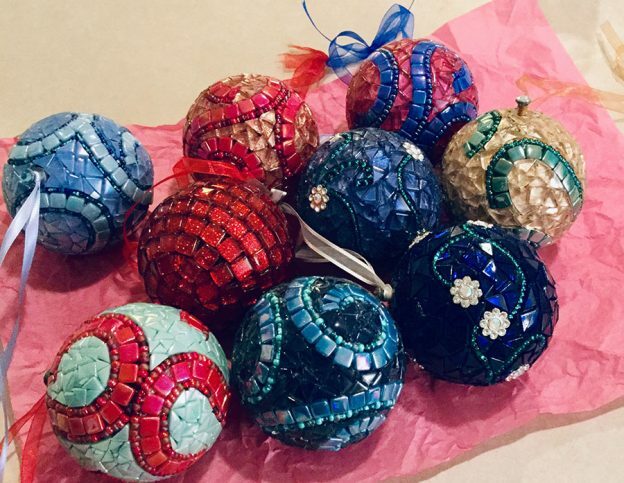 I prefer that people make their own designs instead of making exact copies using craft kits, and so I was pleased to see Morgan’s ornaments and how she had made each one different and how they looked as a group. Note how tightly executed the mosaic work is in the blue ornament with minimal spacing between tiles. 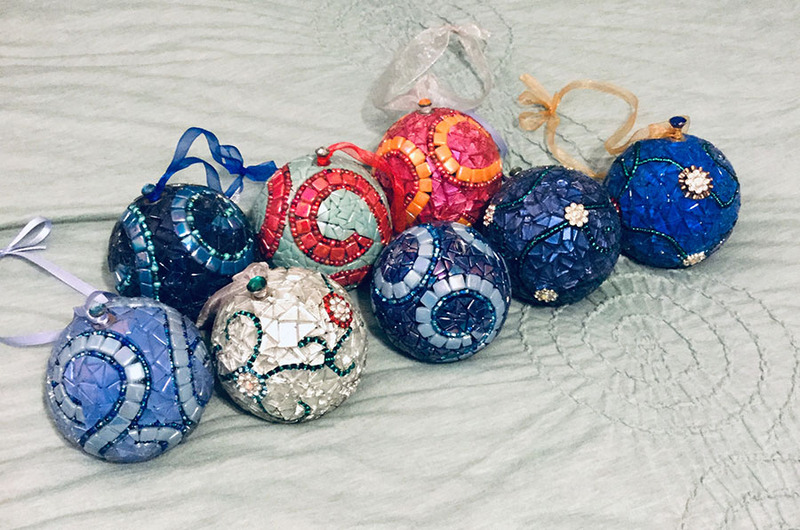 Note that each ornament is different, even the ones that use the same pattern because there are different color choices, including whether or not to use all similar hues or contrasting hues. A second group photo showing additional variations on the same design. This entry was posted in Uncategorized on December 20, 2018 by Joe Moorman. I like these. Nice work. These ornaments are so beautiful! 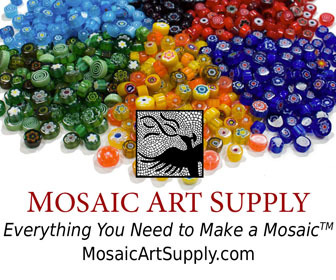 So, I’m pretty new to mosaics, and there is no where in my area to take lessons. These do not look like they are grouted. If the object you are making is being used indoors, you don’t have to grout? They are lovely and I’d like to ask about the grouting: some areas appear un-grouted and some bead details look like they are carefully grouted with black. Is there such a thing as clear grout? I actually chose not to grout them (I was concerned about the weight, but I actually don’t think grouting would have made much difference weight-wise in hindsight). But I painted the bases black before I started using acrylic paint. Thank you @ Patricia Crain! @ Karen Brow-Meier: thank you! To answer your question, I actually did not grout any of the ornaments shown. I was concerned that the ornaments might be too heavy and did not want to add any weight. I painted each of the bases using acrylic paint prior to beginning the mosaic process. In addition to providing a dark background, the paint also gives the styrofoam a tackier background and helps (at least a little!) in keeping the tiles from sliding around. Joe’s advice of using either hot or cool air to help dry the glue also goes a long way in preventing everything from sliding off. That’s a great idea — opens up some new possibilities for using the color of the surface we work on as more of a design element. I appreciate your response. So beautiful! Really amazing work. Thank you for sharing these.